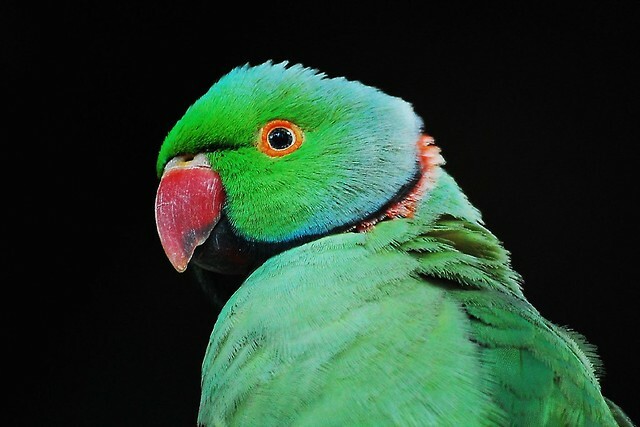 An Orange-winged Amazon at Kuala Lumpur Bird Park, Malaysia. Before choosing a bird as a pet, it is important for you to know that many birds have extremely long lifespans. Canaries, budgies, and lovebirds can all live eight years or more, and macaws and cockatoos can live well beyond 40 years. For this reason, many bird owners appoint a guardian for their bird to ensure continuous care in the event that it outlives them. When observing birds, it is easy to notice that it seems they are always eating. Whether they are outdoors eating small insects or a pet consuming their nutritious feed, it is necessary for a bird to eat at least half their body weight each day to be able to survive. Pet owners should be conscious of this fact so that they can plan their bird's feeding routine accordingly. Birds also prefer variety in their diet so include the occasional treat in your pet's bowl. Due to the social nature of birds, it is critical to provide them with constant stimulation that they can use to keep boredom at bay and find comfort. Colorful toys, jingle bells, and climbing structures can all enhance a bird's cage. 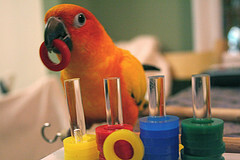 Birds also notice a change in their environment so you may want to trade out toys from time to time. If you must leave your bird alone during the day, use a radio or television to provide auditory stimulation that is similar to social conversations. Interacting with your bird regularly has its share of rewards. Through chirps, mimicking and even repeating words, this pet can show happiness and forge a long-lasting bond with its owner. Understanding and responding to the finer nuances that make birds unique will enhance your relationship with your favorite avian companion while safeguarding their health and longevity. TRAVELING with your BIRD - some tips from folks who travel with their bird every day. Before we get into specifics, let’s start with the basics. Emergencies aside, if you’re planning to travel with your bird, get the travel cage a few weeks in advance. This will give your bird time to get accustomed to the new cage. Also, measure - measure - measure. Make sure it will fit in where ever it will be going car, travel trailer, family vehicle, motor home, commercial airliner, vacation cottage - just make sure it fits. We don’t have a flock, we have one small Indian Ringneck - Sunshine. Sunshine is 17. Catherine acquired him as a baby. He loves being with mom. We know about traveling with a bird. At home, he has a 30 x 30 California cage, a large playstand in the dining room and another playstand in the kitchen. Every workday Sunshine climbs into his custom, 18-inch long carrier and comes to work with us. We open the carrier, he climbs up his Booda perch into his 26 x 20 HQ cage and finishes breakfast. Afterwards, he’ll walk back out via the Booda perch onto his King’s acrylic playstand. When he gets bored he fly’s onto his Prevue playstand or his Prevue 20 x 20 wire cage where he’ll stand so he can watch mom oversee the shipping of packages to our customers. We spend many of our summer weekends at a campground. When we get there he usually goes right into his 18 x 18 Prevue cage. We modified our small travel trailer so the cage fits nicely into a closet where we removed the top of the door and provided a gentle light. When we’re outside the trailer, we have a large canopy/tent where Sunshine spends time in his 32 x 21 HQ aviary under the canvas. He always has one side of his cage against a wall for his own privacy. 2) he’s happy just to be with us. A travel cage can be metal, fabric or plastic like - rigid or collapsible. Because it’s a travel cage only makes it slightly different than his home cage. If its metal, bar spacing should be appropriate. If it’s fabric, the fabric should be durable enough and well designed to discourage chewing. Clear plastic cages allow for great vision but may be confining for extended travel periods. It may only have one perch instead of three or four. Make sure it’s comfortable on the feet. Stopping and starting in traffic should not cause your bird discomfort. A couple of small toys should be introduced to keep birdie boredom down. If you’re traveling by auto, keep the bird in the back seat away from airbags in case of “god-forbids.” Keep it strapped with a seatbelt to avoid sudden movement. If your driving at night, cover the cage, the intermittent glare of auto lights can be scary, especially if it's after bedtime. If you’re taking a road trip stopping at motels, find a place to put the travel cage where you bird can sleep with as little disturbance as possible through the night. We usually find the bathroom counter to be the best spot, it’s out of the way and once the cage is covered, affords privacy. In terms of temperature, it’s simple - if your comfortable, your bird is comfortable. No hot cars with the window cracked or in front of air conditioners in hotel rooms. If traveling for the first time, we suggest a few trial runs before the big trip. Go to friends, the vet or even just a ride, the bird gets accustomed to the procedure, travel process and change in general. If you let the bird out of the travel cage while in the vehicle don’t forget to put him back before any passengers open the door. Some birds don’t like to poop in their travel cage. This is a judgment call. Choose carefully where you’ll let them out to poop. You also may want to check out the nearest avian vet to your destination, before you get there - just so you have the info. Unfortunately, accidents can - and DO happen, so it's always a good idea to be prepared! While accidents usually produce obvious injuries, illnesses are often kept well hidden by birds. In nature, if you're sick you pose a threat in making your whole flock vulnerable to predators, so parrots have become adept at masking signs of illness. This is one reason that it's vital to have a "well-bird" check-up annually. Needless to say, once a bird is showing obvious signs of illness, he's often very sick and needs immediate vet attention. First Aid is intended to help you get by until you can see the vet, or in treating minor injuries. It's helpful to have a "hospital cage" for emergencies - a smaller, easily portable cage where you can isolate a sick or injured bird and easily move him to a warm, quiet, area of your home. It's advisable to have a quarantine area as well - for new birds coming into the home, as well as sick birds recovering from an infection. This area should be well separated from the rest of your birds to prevent air-borne transmission of germs, as well as those spread by direct contact. Some of the signs of possible illness include: more time on cage floor, talking and playing less, fluffed feathers, lack of appetite, drinking more water, personality changes (such as becoming bitey or not wanting to come out of the cage), tail bobbing, puffy eyes, sleeping on both feet with head tucked, droopy wings, sneezing or coughing, "clicking" in chest, vomiting, diarrhea, soiled vent, etc. I won't go into specific diseases here, but hopefully, you get a general idea - if things are "different," get to the vet! Other problems include broken blood feathers or egg binding. Broken blood feathers (or those accidentally clipped) can be hard to stop bleeding. Do not use styptic powder on the skin or soft tissue - only on bleeding nails. Otherwise, use corn starch as a coagulant. If the blood feather (immature feather with live blood supply) won't stop bleeding, it has to be pulled or the bird can bleed to death. So get in the habit of inspecting your birds on a daily basis, and being alert for signs of distress. Read up on diseases and gain a basic knowledge of illness in birds. "Bird proof" your home, avoid toxic fumes and unsafe toys. Have a first aid kit and hospital cage available. No what's "normal" for your bird and act quickly if things don't seem right. Find a good AVIAN vet and see them annually. Be sure your house and your bird's cage and play areas are as safe as possible. Feed the best diet you can to ensure your birds' best possible health. Wouldn't it be nice if your first aid kit never gets used?! Marilu Anderson, Bird Nutrition and Behavior Consultant, (503) 771-BIRD. Finch aviaries are beautiful homes for birds. These aviaries provide them with a bigger space that is more like their natural habitat than a simple cage. You can either opt for either an outdoor finch aviary or an indoor finch aviary. There are lots of aviaries for sale that would suit either an indoor or an outdoor setting. However, if you are up to the challenge, building your own aviary isn't entirely impossible and might just give you a sense of satisfaction and achievement afterward. An indoor aviary may be installed after being obtained, bought, or built directly into the walls of your residence. Make sure the aviary is equipped with tree limbs that are safe so that your birds have a place for perching. Do not overcrowd your aviary with plants or perches, because finches need to fly often for exercise. It is not recommended to place too many toys and perches along the length of their flight path because they would only be flying short distances. Spacing the perches appropriately ensures that they fly longer and exercise their flight muscles. The aviary must have good ventilation, air filters to help the quality of air, and organic sunlight since direct sunlight is not necessary. If you choose to buy or make an indoor aviary, do take note that cleanup time will involve a lot more labor compared to when you have an outdoor aviary. You will need to clean about 2 to 3 times per week to get rid of droppings and fallen feathers. Therefore, it is extremely important that your indoor aviary is made of materials that are easy to wipe off or clean to minimize time and effort spent on cleaning. Ceramic tiles and linoleum as flooring are among the top choices of pet owners. Outdoor aviaries are equally beautiful but it can get very complicated. You have to deal with factors such as weather and predators. The aviary can be a good home for your finches if you live in a warm climate. However, there are people who only use their outdoor aviary during the summertime, though. But if you take into consideration the general disposition of these birds, it might not be a good idea to keep transferring them from one place to another. Some types of finches don't adapt well to frequent changes in location. If you opt to have an outdoor aviary, you must ensure that your finches have access to shade, protection from wind and rain and that the interior of the aviary cannot be accessed by predators such as rats, mice, snakes, dogs, and cats. Adding a layer of mesh around your outdoor aviary will be an added protection because it will prevent predators from having access to your aviary. A double entry may also be necessary so when you enter the aviary, no birds can escape easily. Buying an outdoor aviary may cause you more money though. However, if you prefer it rather than building one, remember the basic safeguards you would normally look out for when building your own outdoor aviary. Finch aviaries can boost your finches' health; mainly because aviaries are bigger and you can design it in such a way that would simulate the birds' natural environment outside, therefore increasing their quality of life. Grace Hutchings is a World Class Finch Fanatic who loves finches. To learn more on Finch Aviaries please go to http://www.petfinchadvice.com.